Henrietta Inman's fantastic energy bars can also be shaped into handy energy balls if desired. Packed with nuts, seeds, fruit and protein, these healthy snacks provide the perfect pick me up throughout the day. 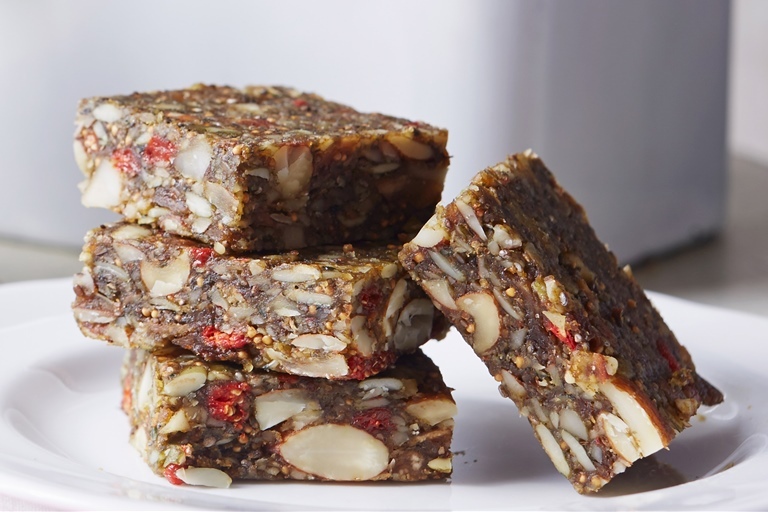 Containing the kings of the seeds: hemp, flax, chia and pumpkin, these bars certainly deliver on nutrition, being powder-packed with protein, essential fatty acids and fibre. I also like to add the superfood moringa, which has thirteen essential vitamins and minerals, is high in protein and rich in iron and antioxidants. Recipe and images extracted from Clean Cakes by Henrietta Inman, photography by Lisa Linder. Published by Jacqui Small (£20). Henrietta Inman trained as a pastry chef, working at the Lanesborough Hotel, London, among other prestigious restaurants and hotels. Now living in rural Suffolk she runs Henrietta Inman Pâtisserie alongside supplying festivals, pop ups and farmers' markets and running regular cookery classes.